Valve's Portal 2 ARG is almost at an end, and potato chips are disappearing at an alarming rate. And just what is the Half-Life G-Man doing here? 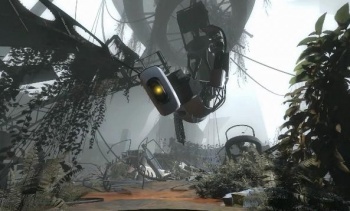 Gamers worldwide tried their damnedest to unlock Portal 2 early, but alas, it seems like our efforts will come to naught, leaving everyone with nothing but a bunch of excellent indie titles obtained at a rather impressive discount. A shame, really. - but wait, what's this? While the countdown on the Aperture Science page is still proceeding as planned, there's a second countdown - of the "pepper and sea salt" variety. The potato chips that gamers were racking up over the weekend (seen below the bars) are now vanishing, presumably because GLaDOS' reboot process left her wanting something crunchy. As of the exact moment I type this, there are 420,761 potato chips remaining. Since they seem to be disappearing at a bit over 10/second, if we convert that into minutes and hours, then the potato chips will reach zero around 10 or 11 PM EST - faster than the regular countdown, but only by a few hours (or my math could be totally off). To make matters more interesting, the folks at ValveARG are claiming that the mysterious Half-Life G-Man can be seen in the page's background. This isn't the first time that Valve has tied Portal 2 to the long-dormant Half-Life series, teasing fans desperate for a single scrap of Gordon Freeman. What does this mean? I haven't the foggiest, but it proves one thing: Valve is damn good at screwing with everybody. Magnificent bastards.